Black face mask and black side whiskers, a somewhat gawky foreign species with a raccoon-like face; the only canine species to hibernate. 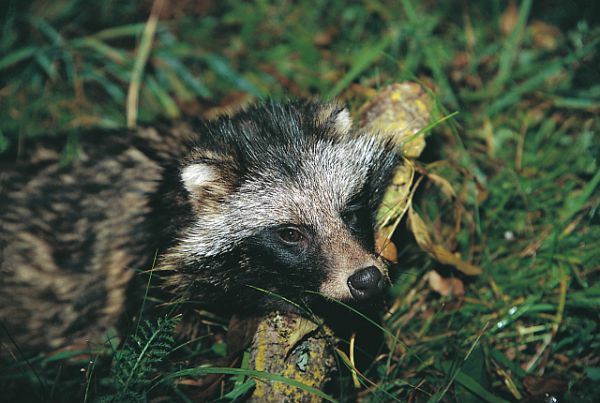 The original homelands of the raccoon dog are far from Estonia – Ussuria, Manchuria, Korea, south-east China and Japan. More than 9000 raccoon dogs were resettled in 1929-1950 from East Asia to regions of the Soviet Union bordering to Europe. From there they spread quickly to Western Europe. The first stray raccoon dog in Estonia was caught already in 1938, in south-eastern Estonia. Ten years later individuals that had come from the east were encountered regularly. In 1950, 86 raccoon dogs were set loose regionally in Estonia, to enrich nature as a valuable fur source. The looters of bird nests were even let loose at the Puhtu Ornithological Centre: the goat set as gardener. With its exceptionally good adaptability and high fertility the raccoon dog spread quickly to the whole of Estonia; the numbers were kept within limits because the fur was very well paid for. Less than 20 years ago many people paraded haystack-like raccoon dog fur hats in the streets. It was fashionable. The one-time protected species has become today’s undesirable species whose numbers should be brought down to the lowest possible, and even better if there were none at all. The fur of this creature, exiled far into the West, is no longer valued here and interest in it as a source of income has dropped. Its natural enemies (wolf, bear, lynx) alone cannot keep the numbers within reasonable limits and hunters don’t bother to waste shots on it. On the long list of sins of raccoon dogs are the decrease of ground-nesting gallinaceous birds and the spread of rabies and scabies (mange). The number of raccoon dogs roaming in our forests and on the shores at the moment nobody can tell exactly. But it may be said that they have never been as many as now.